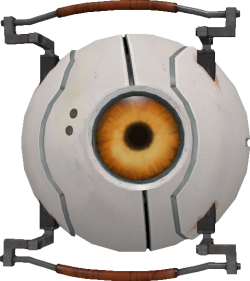 The Hover Turret (also referred to as the Lazer Turret) is an unused turret from Portal 2. While the turret's programming is still in place within the game's files, it lacks a model; spawning it with a code or placing it with a level editor will result in a blue "ERROR" placeholder model appearing instead. In a pre-release screenshot, it was shown to share the Curiosity Core's model; instead of hovering, it was suspended by a cable from the ceiling. Its eye was a slightly different shade and glowed more than the Curiosity Core's. It can be spawned in-game using the cheat command ent_create npc_hover_turret. Like the standard Sentry Turret, the Hover Turret is initially inactive until a player enters its range of sight. The turret fires a blue-colored laser that hurts (and eventually kills) any player that it touches in a manner similar to a Thermal Discouragement Beam. Unlike a Thermal Discouragement Beam however, the Hover Turret's laser does not inhibit movement and cannot be used to activate Thermal Discouragement Beam receptacles. The Hover Turret itself is not stationary, and rotates to follow the player. If the Hover Turret is released from its tether, it can be carried and will not fire its laser until placed gently on the floor, when it will then resume firing upon the player. If dropped from above the player's height (about 128-192 Hammer units), it will explode after a brief countdown. Like other npcs, the Hover Turret has a script file in the portal 2\scripts\ folder; however, none of the corresponding audio files that it references were shipped with the retail game. While the original model is missing from the files, a fan-made patch can be downloaded that restores most of this npc's functionality. The Hover Turret has an accompanying entity known as ent_hover_turret_tether, assumed to be the cable that attaches it to the ceiling. However, there is no documentation for its use. When it explodes, the Hover Turret will take shape as a broken Glass Futbol. Several Hover Turrets as seen in Portal 2 - The Final Hours. The Hover Turret as it exists in the retail release of Portal 2. Unused Pneumatic Diversity Vent screen of the "Lazer Turret"
A turret hanging from the ceiling, as it appears with the fix addon. This page was last modified on 20 September 2017, at 04:51.